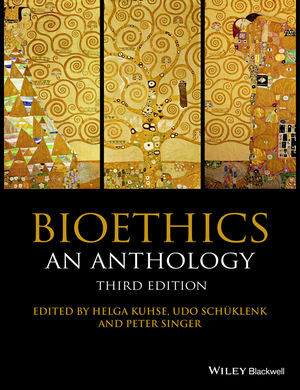 Now fully revised and updated, Bioethics: An Anthology, 3rd edition, contains a wealth of new material reflecting the latest developments. This definitive text brings together writings on an unparalleled range of key ethical issues, compellingly presented by internationally renowned scholars. Helga Kuhse is Adjunct Research Fellow, Centre for Human Bioethics at Monash University. She is the author, co-author or editor of more than 150 professional articles and some 15 books, including The Sanctity-of-Life-Doctrine in Medicine: A Critique (1987), Caring: Nurses, Women and Ethics (1997), Unsanctifying Human Life: Essays on Ethics (2006), and A Companion to Bioethics, 2nd Edition, (2012). Udo Schüklenkholds the Ontario Research Chair in Bioethics and Public Policy at Queen's University at Kingston in Canada. He is a Joint Editor-in-Chief of Bioethics, the journal of the International Association of Bioethics. He is the author, co-author or editor of 160 contributions in journals and anthologies and 7 books including 50 Voices of Disbelief: Why We Are Atheists 2009), The Bioethics Reader (2007) and 50 Great Myths About Atheism (2013). Peter Singer is Ira W. DeCamp Professor of Bioethics at Princeton University and Laureate Professor at the University of Melbourne. He is the author, co-author, or editor of more than 40 books, including Animal Liberation (first published in 1975), widely credited with triggering the modern animal-rights movement, Practical Ethics (third edition, 2011), In Defense of Animals: The Second Wave (2005), and The Life You Can Save (2009). In 2005, Time named him one of the 100 most influential people in the world.An Australian, in 2012 he was made a Companion to the Order of Australia, his country’s highest civilian honour. Germain Grisez and Joseph M. Boyle, Jr.